If anyone still harbored doubts about Johnny Robertson - leader of the local cult calling itself the "Church of Christ" - those were erased during last night's broadcast of What Does the Bible Say? on WGSR Star 47.1 from Reidsville. During the program, which included pre-recorded footage of Robertson speaking yesterday at his "Martinsville Church of Christ", Robertson exclaimed that to have the wrong funeral is grounds enough to displease God! Robertson told his followers to make sure that no instrumental music be played during their last rites. "If you haven't determined how your funeral is going to go, you need to! Because you have family members who do not agree with what I just quoted from the Bible in Ephesians 5:19 about speaking to yourselves in songs, hymn and spiritual song! They will have you in your funeral, all kinds of pianos and stuff like that playing, and you won't want that not at all! But if you haven't said so, guess what? Your family gets to do what they want to do. So let me encourage you today, as we sing that song and we think about going home: when you leave us here behind, as you go home, make sure you leave us some instructions and your family some instructions so EVERYBODY knows how your funeral is SUPPOSED to go. We won't want people dishonoring you, your memory when you leave, what we mean by that is dishonoring you before God. So make sure you make those instructions, young or old, and give them to somebody else who is faithful and will make sure those things get carried out." So according to Johnny Robertson, you are sinning before God if you have musical instruments playing at your funeral. Which makes it all so vital that you leave explicit directions prohibiting pianos, organs and the like from being used when you can't raise any objections from your casket or urn. That is hyper-legalism to the nuttiest extreme that I have ever heard of. Heck, Robertson and his followers are worse than the Pharisees were! Jesus took the Pharisees to task for the ridiculous lengths they went to in following the law. In the case of the "Church of Christ" cult (again, it has nothing to do with the regular Churches of Christ) they can't follow the law nearly enough so people like Robertson have to make up law that's not even scriptural! Ephesians 5:19, from the New International Version, simply states "Speak to one another with psalms, hymns and spiritual songs. Sing and make music in your heart to the Lord". Nowhere does it ever say in the Bible that to have instrumental music is an affront to God. We can't dishonor God after we have already left this world and gone into His presence. And not Johnny Robertson or anyone else should have this kind of unhealthy focus on whether our funerals are "right or wrong" anyway. It's the life which Christ has given us that matters most of all: that life free by grace according to the rule of love, and not enslaved to the rule of law. 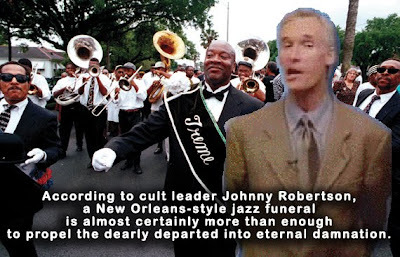 I'm going to hire a jazz band to play at Johnny Robertson's funeral when he kicks the bucket. Or even better, have Shirley Phelps Roper bring her Westboro Baptist Church family and play the instruments at it. I have a better idea: Robertson's cult members should pool their money and buy that tomb above Marilyn Monroe's. When his time comes put Robertson in in so he can spend eternity with Marilyn Monroe and Hugh Hefner. Since Johnny Robertson has claimed to be God, this will be his chance to be put in a rich man's tomb (Isaiah 53:9) and numbered with the transgressors (Isaiah 53:12). Where, in any of the material quoted here, did JR say that playing instrumental music at someone's funeral would damn them to hell? I don't see it. Truth is, once you're gone, whatever gets done with your remains matters not one whit to your eternal destination. However, JR was making reference to those who might attend the funeral of one who departed "in the faith". On that point, we have much latitude to discuss and contend. Have on . . .
JR, Oldfield and Micah say lots of times that instrument music is a sin and that whole churches that have it are lost and going to hell. JR has to be a control freak over his followers in their death as he does in their life. Hold on a second! Johnny has been all about instruments in CHURCH WORSHIP being a sin. Does Johnny now think that a funeral is a church worship service too??? Johnny is adding on to scripture in a brand new way this time! We should arrange for Johnny Robertson to be baptized by proxy and become a Mormon. "Where, in any of the material quoted here, did JR say that playing instrumental music at someone's funeral would damn them to hell? I don't see it." You don't see it because it's not there. I could care less about Nut Job Johnny but this is pretty common as this blog goes. Following a piece about "lazy" reporting, he inserts his opinion and presents it as fact. Talk about the kettle calling the pot black. Ol You Know Who and the last person are both wrong. Chris didn't say that music at a funeral would damn a person to hell. I can only find mention of that in the graphic he did with the jazz funeral, and that's pointed satire. But I've heard Johnny Robertson and James Oldfield say lots of times that churches with instrumental music are sinning and going to hell. So I can see how easy it is to infer that instrumental music at a funeral will damn a person to hell in their thinking as well. Is Johnny okay? He's looking and sounding more sick every time he comes on television. When he started talking about funerals and wanting to leave this world, was like he was expecting to not be around for long. Chris, I think you'll approve of me saying this. Let's keep Johnny Robertson in our prayers. Even if he doesn't believe that the prayers of anyone outside his cult are heard by God. He won't pray for people he calls his enemies but we can still pray for him. I'm still waiting for them to tell us how Ezra 10 was used in the New Testament! How when 1 Cor 12:3 says no one can say Jesus is Lord without the Holy Spirit, that this same Holy Spirit is gone and all that is left is the sword of the spirit! How a man who's prayers were called a memorial to God was still marked for Hell at the time he prayed them! How Cornelius was even heard and responded to since God does not hear the prayers of sinners! How those in the Catholic Church who put the Bible together were under the guidance of the Holy Spirit while at the same time damned to hell for the wrong name on their Church! If Churches of the Gentiles is a valid church name since the same exact form of the Greek word is used in Romans 16:4 as is in Romans 16:16. How the Holy Kiss is commanded 5 times in the bible but can be ignored by us since we must follow all the commands per them! How it is that God can violate his own commands and still be called Holy since he is Holy according to scripture, the CoC believe that God kills the innocent and yet he hates the hands that shed innocent blood. How is it that since the CoC standard of God's is Holiness is to tell us to do one thing while he does another how we are to be Holy since God is Holy? Does that mean we should tell people to do one thing and we do the opposite? If God kills the Innocent and that's OK for God to do, why was Jesus adamant to state that no one was taking his life but instead he was laying it down since God had told him to do so? Could it be that God does not kill the innocent and thus Jesus had to lay down his life instead? Hey, isn't anyone going to mention Charles Roark and WGSR? It was late the day Charles Roark got out of prison . . .
And I had to meet him at WGSR in the rain . . . But before I could get there in my pickup truck . . . He got run over by a &*(#@% ol' train . . . This is on television? What sort of television station allows this kind of crazy man to have a program? Some of these comments are especially clever. I particularly like the one suggesting that Robertson will eventually be baptized by proxy into the Mormon Church... which likely will happen eventually. What if Johnny is dying and all his bothering faith healers lately is because he's desperate for a cure. Man, that stuff WalkingingLove writes makes my head hurt. He/She could write for Monty Python. Johnny Robertson and his bunch is the joke of Henry County. The police and sheriffs dept. here are getting sick to death of dealing with calls about Johnny's cult, which is what it is, hassling people for no reason. And Johnny is known as the biggest liar in the entire south of Virginia. Personally I don't think there really is a Martinsville Church of Christ. I've heard there aren't more than 20 or 30 people that meet when it used to be a lot more. It's a cult that's dying, thank God. "You should try writing it LOL"
Cool!! Someone on here that can take a joke. Thanks. Read this letter to the editor of the Martinsville Bulletin written by Johnny Robertson. That is how big of a heartless godless excuse of a man he is. One show that I consider a classic COC show was at the end of last year. Johnny Robertson announced a caller as Mr.King (Reverend?) and added this person had a ministry not doing too good. Mr. King asked Robertson if he believed he was right and everybody else was wrong. Robertson said Sir I believe I’m better looking than you. He said I know who you are and I believe I’m better looking than you are. Robertson asked what difference does it make what I believe. DON’T FORGET LAST YEAR WHEN THE GOOD PEOPLE OF THE COMMUNITY UNITED AT BUCKETS GRILL AND PUB IN MAYODAN NC TO PRAY FOR ZACK A 15 YEAR OLD BOY WITH A RARE ILLNESS. EVANGELIST JAMES OLDFIELD OF THE CHURCH OF CHRIST SAID UNRIGHTEOUS PEOPLE WERE PRAYING FOR ZACK AND THEIR PRAYERS WERE NOT BEING HEARD. HE SAID THEIR PRAYERS WERE NOT GOING ANY HIGHER THAN THE CEILING. PEOPLE WERE GIVING MONEY TO A MAN SELLING BEER. Johnny's cult is dying. Everybody knows it and he knows it too. There is no more cult meeting in Reidsville they have to go to Eden but I'm told there are very few who go there. There aren't many meeting in Danville and there aren't many meeting in Martinsville. The tent meeting the other month hey I drove past it and there were about 3 or 4 people under a big white tent including Johnny and no one else. Chris and Nathan and Bonservant3 and all, you have done a good thing standing up to the Johnny cult and I believe you will soon see him run out of town. Last week a caller told Mark McGinnis the Church of Christ guy that he was not perfect and he told the caller he was PERFECT. The caller asked if he really believed he was perfect and McGinnis said yes sir I do. Who is this Bob Lawson guy? He's putting Chunks Roark and Johnny Robemsome in their place! Johnny tells everyone else that they're wrong. Johnny can't tell us why he's right though. I don't think Johnny is right either. Bob Lawson is an agnostic. But he will still chew Johnny Robertson up and spit him out. I hope Bob Lawson realizes he is up against Johnny Robertson and Charles Roark. Tuesday night we should make like Ripley said in Aliens: "Nuke the site from orbit, it's the only way to be sure." I wondering what sections of this "Debate" with Mr. Lawson, Johnny Robertson will choose to rewind a thousand times or more. What ever choice Johnny Robertson makes I am sure it will be rewinding next year at the same time. I am just as sure Johnny Robertson will be standing beside the screen in the future admiring himself, puffing up his lips along with his Excessive Eye Blinking. Johnny Robertson is not now, and never has been, interested in "discussion" and "debate". Robertson just wants more grist for his mill. And then he sends the footage back to his sponsors in Texas as proof of his "good work" in Virginia and North Carolina, and they send him more money in return. Robertson's is just as big a cash racket as anyone he accuses of being in the "religion business", if not far more so. Musical instruments on a funeral service? Oh common, I've been learning how to play bongos for almost a year and never that I had dreamed for myself to play on a funeral. Is there anyone on God's Green Earth that really believe Charles Roark is not bias with the upcoming debate with Robertson and Bob Lawson. It seems there is a need for the collection of more video to send to Texas to put some green in Robertson's wallet. Charles Roark wants Johnny Robertson to keep harassing people. That's what Johnny uses to make the DVDs that he sends to Texas. Then the Texas cultists send lots of money to Robertson. Then Robertson gives the money to Roark who is the only television station owner in these parts that hasn't a spine to say no to Robertson. Probably because Roark is a fellow convicted thief. Then the cycle starts all over again. I think Bob Lawson lost the debate last night with Robertson as these two convicted persons hovered over him. Lawson said Roark threw toilet paper on him one time he was at the station and yet he comes back on and refuses to mention Roark's crimes. He said he actually liked Roark. I think Robertson is going to get quite a lot of cash for this one.